Wearing a Regatta suit intended to keep him afloat in the event of a cold swim, Walden sank up to his knees in large puddles of water on the sea ice as he and his colleagues took down the experiment’s meteorological tower. Feeling like he was walking on swiss cheese, he tried to convince himself that there was still plenty of ice underfoot. He tried not to think about the thousands of feet of ocean below. 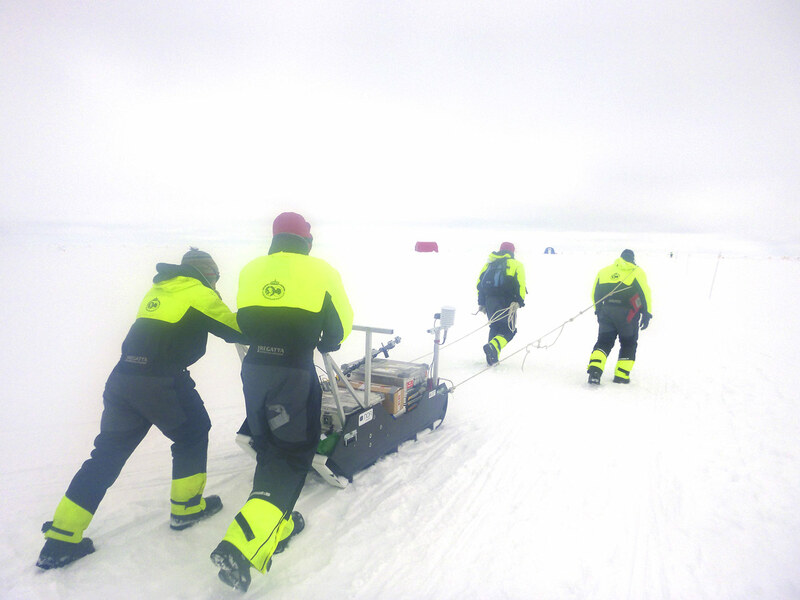 Led by the Norwegian Polar Institute, N-ICE2015 researchers collected data on first-year sea ice for six months starting in January 2015 to understand the critical sea ice system that has changed dramatically over the past 30 years, and then model and predict the impact on the ecosystem, weather, and climate. 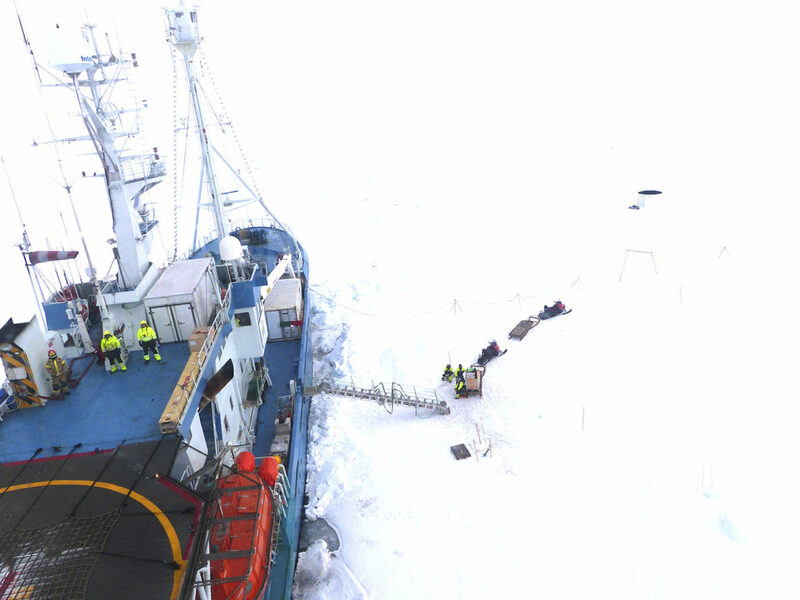 On a Norwegian research ship, the Lance, researchers headed into the Arctic Ocean north of Svalbard, a Norwegian archipelago halfway between mainland Norway and the North Pole. Locked into the ice, the Lance drifted through the dark Arctic winter whichever way the winds blew it. The interdisciplinary team from around the world collected a rare and comprehensive dataset of oceanographic, atmospheric, and biological conditions on Arctic ice during winter and spring. Walden made measurements of clouds as part of the research team and then spent five months in Norway, collaborating on data analysis as the Fulbright Distinguished U.S. Arctic Chair. A team of scientists deploy instruments to study conditions in the Arctic in 2015. The conditions for the study were some of the harshest possible in one of the most inhospitable places on the planet. “It was difficult and dangerous work,’’ says Walden. In fact, the last major interdisciplinary campaign to drift on the Arctic sea ice in winter occurred in 1998 off the coast of Alaska. Since that time, the Arctic and its sea ice have changed dramatically. Many people are aware that there is less sea ice as the Arctic has warmed. Sea ice acts as a natural refrigerator for the planet, keeping the Arctic cool and moderating the planet’s climate. Satellites show the declining extent of sea ice, which has been happening for a generation. The most dramatic sea ice decline has occurred since 2000 with the lowest summertime extent ever recorded in 2012. The 2015 sea ice extent was the fourth lowest. At the same time, though, the ice itself has changed. When Walden was in graduate school in the 1980s, Arctic sea ice was 9 or 10 feet thick in most places. Now, only a small part of the Arctic includes multiyear ice, or ice that exists for more than one year. Today, Arctic sea ice is more like a thin chocolate layer on a dipped ice cream cone—fragile and easily breaking into slabs. The big picture of Arctic sea ice has been well-known and predicted for decades, says Walden. Sea ice is very sensitive to increases in greenhouse gases and to global warming. But the details of what is happening are extremely complicated. Thin sea ice is different from multiyear ice, which matters to everything from zooplankton to the planet’s energy budget, says Hudson. Young ice is rougher and saltier than older ice, and after the first year, the salt drains out. Those properties affect how much heat it absorbs, which affects how fast it melts. And, then there’s the complicating factor of snow—how much and when it falls. Snow on the ice will reflect 80 to 85 percent of the sunlight, but bare ice only reflects 50 to 60 percent, absorbing more of the sun’s warmth and causing it to melt faster. Getting accurate measurements of snow, ice, atmospheric conditions, and radiation are critical and difficult. For instance, the eddy covariance instrument measures little eddies of air—the energy that’s being moved to and from the surface. Or the radiation sensor. On the ship, the researchers had four of them with little fisheye domes looking up and looking down. You have to make sure you know exactly what you’re measuring, he says. Walden has conducted numerous research studies in Antarctica, Canada, and on the top of the Greenland ice sheet. It is very easy to generate a number using a computer model, he says, but it is very difficult to acquire the real data to validate that number. And many times researchers have been too conservative, surprised by the rapid and dramatic change in polar regions, he adds. To get the best information on the properties of young sea ice, the researchers collected as much data as they could as the ice floe melted beneath their feet. When tackling humanity’s biggest challenges of melting sea ice in a changing climate, “the overwhelming feeling is you’re working a lot,’’ says Hudson in an understated way. Researchers on the N-ICE2015 team traveled from around the world—Korea, Norway, Russia, Germany, France, Sweden, Spain, Finland, Britain, and the United States—to Svalbard. All of the researchers received training on the two biggest hazards of the Arctic: falling into the cold ocean and dealing with polar bears. All research on the ship was conducted with a full-time bear guard, armed with flares and a rifle for an emergency. The bears were a hazard, particularly, during the winter when 24 hours of darkness and blowing snow made it difficult to see them. The other danger is shifting and dynamic sea ice. While the N-ICE2015 researchers lived on board the ship, they spent their days on the ice, measuring everything from atmospheric conditions to zooplankton. Sometimes they made transect measurements as far as a mile away from the ship. “There are always problems and challenges you’re facing. It’s always interesting work,’’ says Hudson. Like when a polar bear mangles your instrument. Bears wandered through the research site several times during the experiment, but one March night, one did its own little scientific investigation, grabbing and bending some weather instrumentation that had been carefully installed the day before. “That really adds excitement to your day,’’ says Lana Cohen, a postdoctoral researcher at NPI who spent a couple of months on the ship during the winter and got to deal with the bear’s handiwork as well as the most challenging weather conditions. There were occasional breaks in the work, like a soccer game played on the sea ice and a celebration of Norwegian Independence Day. Food on the ship was traditional Norwegian fare, including salted cod and potatoes, lutefisk, and whale meat. For his part, Walden felt a sense of wonder on the ship, enjoying a different experience from his previous fieldwork. He learned about the world on the ice, seeing plankton grow in tiny cracks, watching water flood over ice, listening to crunching and cracking of a dynamic world, and learning the difference between a refrozen lead and an ice floe. Since returning to Norway, the researchers are “in heavy data analysis mode,’’ says Cohen. Later this year, the project will be featured in a special issue of the Journal of Geophysical Research. There are papers to write and follow-up proposals to draft. Many research questions remain unanswered, such as the effect of clouds on the sea ice and how fall weather conditions affect the sea ice growth. Like many of us, worries about the future and a melting Arctic only occasionally make their way into the conversation. Starting his research career in the Arctic in the early 2000s, Hudson, who has participated in several sea ice cruises, is sad that he never had the chance to see much of the multiyear ice—the thick and hearty ice that was, well, solid. “I get worried for the Arctic,” he says. Melting sea ice promises to impact the Arctic ecosystem, including polar bears, seals, and cod, as well as the people who have lived in the region for thousands of years and rely on that system, he says. Cohen says she is usually too busy to consider the big picture when she’s on the ship. For his part, Walden says it’s a daunting but exciting time to be a polar researcher.